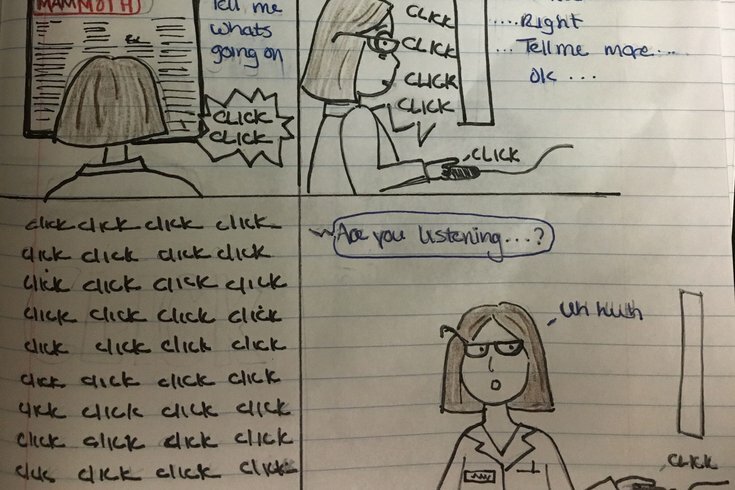 Thomas Jefferson University medical student Laura Ayd drew this comic strip as part of a graphic medicine course designed strengthen empathy, communication and observation skills. Medical students at Jefferson University are now packing a sketchbook alongside their textbooks and stethoscopes – an addition prompted by the school's first major curriculum change in 100 years. The revamped curriculum includes a new graphic medicine course that uses comics to teach lessons in empathy, communication and observation. The class requires students to sketch graphic novels, a format designed to hone their observational skills and, through the characters they create, enhance their ability to see the world from another individual's perspective. The instructor, Christian "Patch" Patchell, published a graphic novel that documented his treatment at Jefferson for squamous cell carcinoma of the tongue in 2007. His novel, "I Put the Can in Cancer: A Journey Through Pictures," detailed the complex emotions and challenges he faced each day. For instance, chemotherapy and radiation are represented by monsters and werewolves. Patchell said he is "astounded" by the level of focus his students give to the patient experience. "The questions they ask about my treatment experience, and their interest in how I expressed that graphically, make it clear that understanding the patients' point of view is genuinely important to them." The new curriculum emphasizes that medical students need to do more than attend lectures and memorize anatomy terms from their textbooks, said Megan Voeller, director of humanities. "Arts-based courses encourage Jefferson students to explore the human experience from a new angle, and use this perspective to shape their approach to patient care," she said.